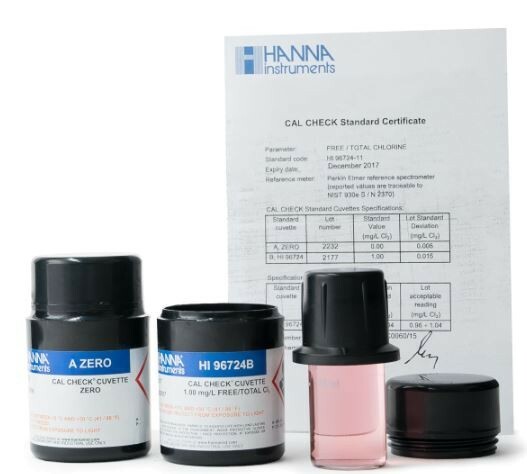 Product information "HI97701-11 Free & Total Chlorine CAL Check Standard KIT for HI977x series photometers"
The HI97701-11 Free and Total Chlorine CAL Check standards provides a simple solution to calibrating and validating the HI97701 Free Chlorine Photometer that has a 0.00 to 5.00 mg/L (ppm) range. This high quality set of standards is manufactured in our state-of-the-art facility and comes supplied with a certificate of analysis. The certificate of analysis provides the lot number, reference values and expiration date for traceability when certifying the HI97701 photometer. HI97701-11 is a high quality set of calibration standards that allows users to validate and calibrate the HI97701 portable photometer that has a 0.00 to 5.00 mg/L (ppm) range. The HI97701-11 includes one sealed “A” cuvette for zeroing the meter and one “B” cuvette that is used to validate or calibrate. The expected reading from the “B” standard is 1.00 ±0.03 mg/L free and total chlorine @ 25°C. The calibration set is produced in our state-of-the-art manufacturing facility using reagent grade chemicals in a temperature controlled environment. The HI97701-11 CAL Check™standards are used for calibration and performance verification of HI977xx photometers with the CAL Check function. Related links to "HI97701-11 Free & Total Chlorine CAL Check Standard KIT for HI977x series photometers"
Customer evaluation for "HI97701-11 Free & Total Chlorine CAL Check Standard KIT for HI977x series photometers"